Hello everyone. This is John Stinson. I thought I'd give you all the history of how the school came into existence. I started Stinson Recording Studios in 1993 while attending the University of Texas in Austin for a degree in music with guitar as my principal instrument. In the first year, Stinson Recording Studios did about $10,000 worth of business out of a 3 bedroom house I rented in Hyde Park. The second year I did 20k, the third 40k, the fourth 80k, and so on. Around year 5 I built the Penny Creek facility. The penny creek facility over the next 10 years became a place where thousands of artists came to make their music productions happen. From the very beginning we took on interns in the studio. As most studio owners know, we realized that our interns took more time to teach then they saved time with their work. For that reason most interns genuinely end up just getting the coffee. I knew that if I really wanted to teach people I would eventually have to design an official program. 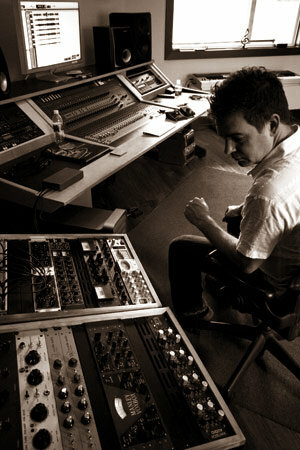 At that time, I was recording mixing or mastering 14 hours a day, 6 or 7 days a week. In order to break up my day I took on some students from The Recording Connection as a mentor. Through the short comings of that experience I decided to design my own program. Just having spent the last 10 years developing one of the most successful production studios in Austin, I knew I could create a program that would truly teach people how to actively become successful. When we first started we were The Austin Recording School. Over the first two years, as the program developed, we realized that due to the intimate, mentor-ship style of the program, and the caliber of students we were looking to attract that The Austin Recording School was not the right name. To reflect our style and approach we became The Recording Conservatory of Austin. After the name change, the school and the recording studio continued to grow and develop. In 2007 we decided to make the leap and build a new facility. We found the property and then spent the next year building the awe inspiring City Park facility. Stinson Recording Studios and The Recording Conservatory of Austin currently function out of the City Park facilities in Austin. Today, The Recording Conservatory and Stinson Recording Studios are growing and thriving more than ever. We are constantly developing new ways to meet the demand of creating real, professional, working engineers and producers. The latest development is our innovative screen share and joinme.com process for one-on-one distance learning and teaching. We are developing this process to fit the mold of the way the music industry is moving to more efficient, smaller studios, more accessibility to the equipment, and more mobility. We teach you the elusive knowledge of how to create professional product and how to create professional business relationships exactly where you want to do your work. As time goes on, we will continue to grow and develop the most innovative ways to teach students how to become truly successful in the ever changing and growing music industry. We primarily work with your budget. The best way to get an understanding of how much a project is going to cost is to come by the studio to discuss the scope of your project and negotiate the rate and time-frame that best fits your project. We can quote hourly, daily, or per song. It is always difficult to match studio to studio. One studio might charge less per hour but take much longer and create a sub par product. What seemed cheaper in the beginning may end up being more expensive, waste more of your time, and leave you with a mediocre recording. We may not be the least expensive studio by the hour but we will definitely be the most efficient, reliable, and consistent studio experience you will have.